Bowing to immense pressure over his use of private jets, HHS Secretary Dr. Tom Price resigned late Friday afternoon. "I have spent 40 years both as a doctor and public servant putting people first," Price said in his resignation letter. "I regret that the recent events have created a distraction from (HHS') important objectives." Acting Assistant Secretary Dr. Don Wright will stand in for Price until a permanent replacement is confirmed by the Senate. Reportedly Price had taken at least 24 flights on chartered planes at a cost of over $400,000. 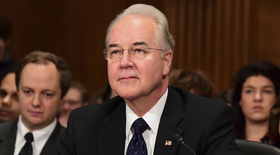 Price said Thursday that he would pay the Treasury just over $51,000 for the flights, according to an HHS spokeswoman. She indicated that this would totally cover the tab owed to taxpayers for Price's seats on the flights. In his resignation letter, Price said HHS was "aggressively" working to empower patients, reduce regulatory red tape and fix a "broken" healthcare system, among other issues. Since his confirmation to the HHS secretary post in February, Price's biggest accomplishment has been canceling and scaling back bundled-pay models. But the agency has yet to approve a Medicaid waiver request with conservative-backed work requirements, lifetime limits or drug testing on enrollees, according to experts. "Success on these issues is more important than any one person," Price wrote. "You may rest assured that I will continue to support your critical priorities going ahead because failure is not an option for the American people."